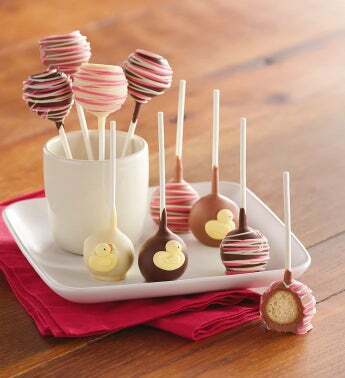 These cake pops celebrating the birth of a baby girl are hand-dipped in milk, dark and white Belgian chocolate. Each is a handcrafted treat in either vanilla or chocolate, and decorated just for the occasion. Each cake pop is individually wrapped for ultimate freshness and packaged in an elegant gift box.